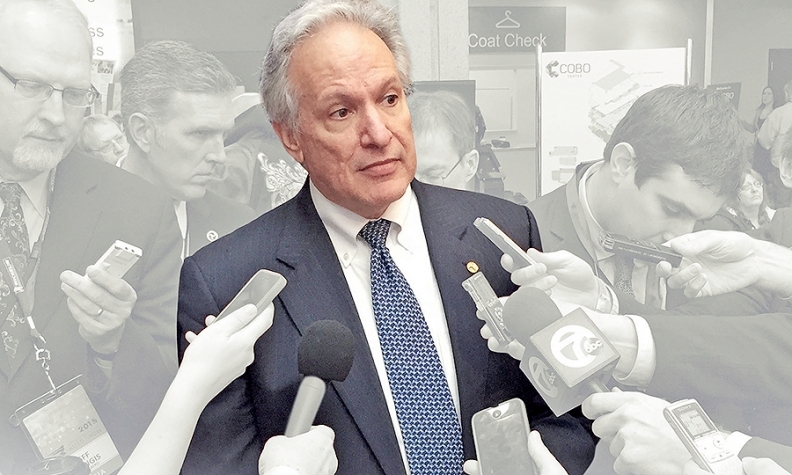 NHTSA boss Mark Rosekind: No retreat from activist role. WASHINGTON -- As the newly appointed head of the National Highway Traffic Safety Administration, Mark Rosekind vowed in January to work closely with the auto industry to promote safety — and to hammer companies that stepped out of line. Summoned Fiat Chrysler's U.S. arm to a July 2 public hearing to review a "pattern" of alleged problems with executing 20 recalls since 2013. Exacted an acknowledgment from Takata Corp. of an airbag defect in some 34 million vehicles. Extended its extraordinary oversight of General Motors' safety operations for at least another year. The whirlwind week was the clearest sign yet of Rosekind's growing imprint on the agency, which has come under heavy criticism in recent years that it's too timid, too slow and too cozy with the industry it polices. With the latest actions, he is invoking extraordinary powers and tools to clear up logjams on recalls, pressure automakers and get unsafe cars off the road. Said Joan Claybrook, who ran the agency under President Jimmy Carter and has been a frequent critic of it since: "I think we have a new sheriff in town." "I think it's good for the auto companies because it means they won't delay recalls forever and have these huge recalls of older cars and get bashed in the media about it." Already, though, some in the industry are privately expressing concern about the new sheriff's guns-blazing approach, fearing that he's moving too fast and too forcefully in the name of safety and could alienate the partners he had sought to court. In the case of the Takata action, for example, NHTSA has set in motion a legal process to coordinate the recalls of the defective airbags and the distribution of replacement parts — even though automakers have yet to pinpoint what's causing the inflators to break apart. That means replacement airbags may manifest the same defect years from now. "The way this is happening makes us nervous," said one automaker's government affairs executive, who spoke on the condition of anonymity. Rosekind acknowledged that risk. "Just to be very direct, that does mean that some people might have to go back for a second [repair] if we find out that the current remedies need to be enhanced," he told reporters here last week. Nonetheless, he has vowed no retreat from an activist role in regulation and enforcement. And that includes coordinating timetables and actions that were normally left for automakers, suppliers and dealers to sort out among themselves. "As we've said repeatedly and emphasized again this week, it's not enough to identify defects," Rosekind said in the news conference. "To save lives and prevent injuries, defects must be repaired." Under a consent decree reached with Takata last week, NHTSA will take the lead in coordinating — with industry input — what could be one of the largest and most complex auto recalls in U.S. history. It will involve 11 automakers and some 34 million vehicles that are as old as 14 years, and a supply chain that's struggling to produce enough replacement parts for the 17 million vehicles recalled before. "We want to ensure that the remedy is organized so that safety comes first," Rosekind said. Allan Kam, a former NHTSA enforcement attorney and safety consultant, says NHTSA's more hands-on approach — and its emphasis on ensuring that recalled vehicles get repaired — should disabuse automakers of any notion that they can put off recalls to save money. "Companies are cost-conscious, and they can actually save money by delaying the recall," Kam said, noting that vehicles are less likely to be fixed as they age or are taken out of service. "Administrator Rosekind seems to be into these issues and wants to accelerate the recalls." That message was delivered directly to FCA US, which was called to an unusual public hearing July 2 to explain its handling of 20 recalls over the last few years, including the timeliness of notifications and repair rates. In issuing the order, NHTSA cited "significant concerns" about whether FCA had met its requirements under U.S. safety laws, and turned up the gas on a long-simmering dispute between the agency and the company over its safety record. "We have done and continue to do a phenomenal amount of work to ensure that we make our cars as safe as we can and that we respond to any recall initiative in an efficient fashion," said FCA CEO Sergio Marchionne in Detroit last week. "The real issue is, for organizations like ours and I'm sure for others, the process of adjustment to this new regulatory environment is going to be painful. We're not used to this, and I think that we need to just step up." "The process of adjustment to this new regulatory environment is going to be painful. We're not used to this, and I think that we need to just step up." Claybrook, who has met with Rosekind several times since he became administrator, says a fearsome regulator can be good for automakers by discouraging the kinds of decisions that could come back to haunt them later. "It means they won't delay recalls forever and have these huge recalls of older cars and get bashed in the media about it," Claybrook said. "I think it helps the auto companies in the long run." That is the thinking behind NHTSA's decision to continue its extraordinary oversight of GM's safety operations for at least another year, under a consent decree reached in May 2014 to punish the company for its long-delayed response to a faulty ignition switch. The defect has been linked to at least 104 deaths and nearly 200 injuries. "GM learned a hard lesson last year," U.S. Transportation Secretary Anthony Foxx said in a statement. "We expect to see the improvements they've made continue and that their new approaches are applied to every GM safety issue and every recall. Today's action will help keep them on the right track." The agency indicated that the decision was mutual: GM was benefiting from monthly meetings with NHTSA officials and wanted to keep them going. A GM spokesman said in a statement that the company has used the meetings "to foster a relationship that's candid, transparent and totally focused on the safety of our customers. We've come a long way and we fully intend to build on this progress." But elsewhere in the industry, executives say they're nervous about what they see as possible overreaching by the agency. For example, Rosekind and Foxx have sought to hold automakers accountable for boosting recall completion rates to 100 percent, compared with about 65 percent currently. But because consumers often ignore recall notices and repair rates decline sharply the older a vehicle gets, applying that standard to the Takata recalls "would be impossible," the automaker government affairs executive said. "Here we are doubling the number of vehicles, and [Foxx] is saying he wants to see 100 percent replacement," he said. "As an industry, how are we supposed to take some of these things when there's not really a process that is workable?" A second automaker government-affairs executive said that the agency's enforcement actions under Rosekind have "heightened our awareness and our sensitivity to how something may be handled." But he questioned whether NHTSA was "getting ahead of itself" by effectively adding millions to the backlog of unrepaired vehicles, asking: "Is that good for consumers?" The executive said, "There's no doubt that Rosekind is really being aggressive at the agency, and he wants to put points on the board."